Here's my great grandfather Warren Nicholas St. Bonnet (September 8, 1885-December 2, 1918). 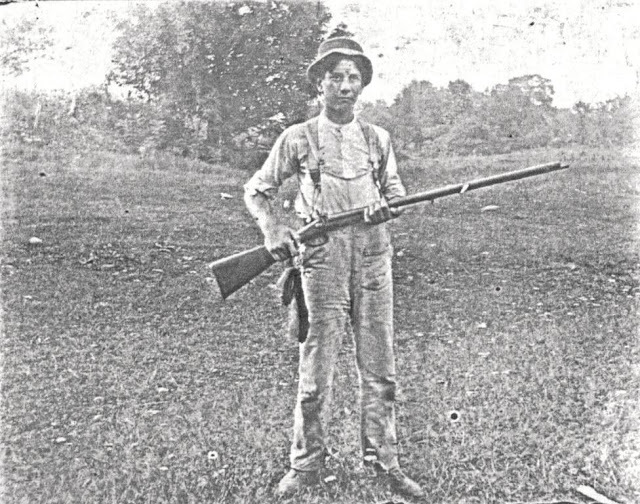 The original of this picture (from which this image is cropped) is probably from before 1914. This is a photocopy of a picture that probably dates to around 1900 or so. Looks like a shotgun he's holding, possibly of American Civil War era vintage. He married Mary Dailey in 1906, and died from the Great Spanish Influenza in 1918. He was a brakeman for the Erie Railroad and living in Moosic, Lackawanna County, Pennsylvania, at the time, though he was also apparently a postman, too, at one time or another. Transcript of a newspaper clipping from a family scrapbook: MOOSIC, P[A]., Dec. 3 -- Warren St. Bonnett, aged thirty-three years, of East Spring street, died at the State Hospital, Scranton, at 10 o'clock Monday morning from influenza. He is survived by his wife and six small children, also his parents and two sisters. The remains will be taken to the Vineyard Cottage, the home of his parents near Stroudsburg. The funeral will be held from there Friday afternoon. Burial will be made in Stroudsburg cemetery. [Note: by the 1918 calendar, date of death was December 2].